Advertisement for a truck made by the Winther Motor Truck Company. Headline says, "Built for the Service - Trucks Now Must Yield". 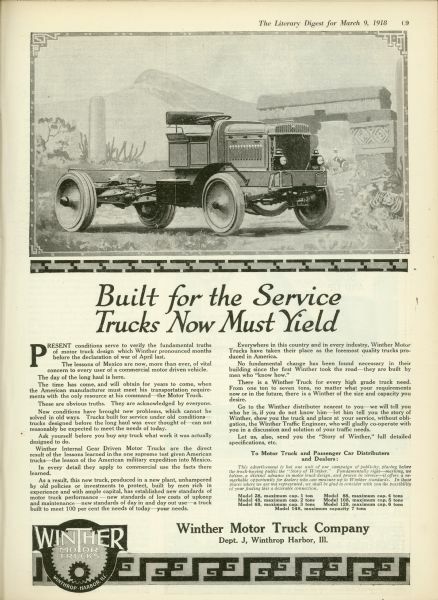 Advertisement from "The Literary Digest" - Vol 56 - Mar 9, 1918 - p C9 Martin P. Winther formed Winther Motor and Truck Company in 1916, initially manufacturing a rear-drive Winther truck. Shortly after, the factory manufactured the 4-wheel-drive Winther-Marwin truck, and the Winther passenger car 1920-23. The truck cabs were open and fitted with low doors. Initial capacities were 2,3,4 and 6 tons and were priced from $2,750 to $4,600. Later vehicles extended the line and included trucks in the 1 to 7 ton range. As early as 1919 the company claimed that the Winthers vehicles were the dominating truck in the U.S. Navy. The smaller (1-2 ton) trucks were aimed at the agricultural market, while the heavier models were intended for use in the logging, fire fighting, and snowplowing industries. The latter made early use of rotary plows; one of the largest used two engines, the rear one over the rear axle to drive the truck and the front one for the plow, with the fully-enclosed cab between. In the 1920s, electric starters were added to most vehicles. In 1926, the company produced five vehicle styles ranging from 1 1/2 to 5/7 tons. In its last year the products were renamed Winther-Kenosha, and in the summer of 1927 the plant was sold to H.P. Olsen.